Bacteria have a major impact on natural ecosystems, human health, disease progression and industrial processes using bacterial cultures, but viruses that infect bacteria can influence all of these systems. 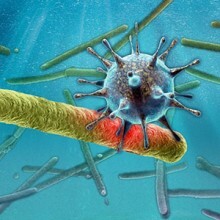 A recent study revealed how viruses that are common in the environment can efficiently infect some bacterial cells but not others. A better understanding of how host cells control viral infection could be invaluable for modeling virus-host interaction ecology, as well as for designing virus cocktails to fight pathogens.